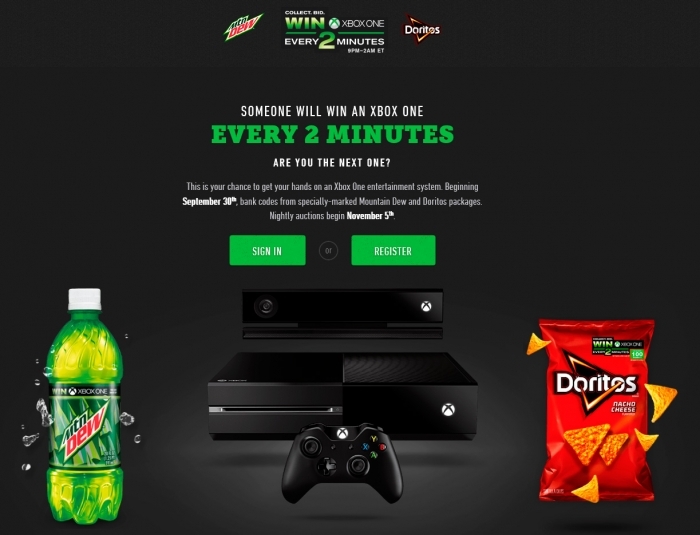 Win an Xbox One every two minutes, console coming late November? It contains details of a competition to give away an Xbox One every two minutes beginning November 5. It gives us further insight to the release date of the Xbox One (which Microsoft still hasn’t told us!). You need to purchase specially marked Doritos packs or Mountain Dew drinks in order to collect game codes. Then starting from September 30 you’ll be able to enter the codes onto the website in order to bank points. Each code you enter will also give you one entry into sweepstakes for an Xbox One. Beginning November 5 you can then use the points you’ve banked to bid on Xbox One consoles that will be put to auction from 9pm to 2am ET each night. The points can also be used to score some Xbox One swag from the Marketplace. Xbox One has a targeted launch date of late November 2013; therefore, the initial shipments may be slightly delayed; please allow 12-14 weeks for delivery. So if that is correct (and of course it just says “targeted”, not confirmed or anything else) then it looks like Microsoft will not be first to the next-generation market against the Playstation 4. When will it arrive in November though! ?